Does Board support Ragged Hierarchy (aka hierarchy that has an uneven number of levels)? can you please specify your question. Board supports multiple parallel hierarchies meaning that an entity can have multiple roll-up paths. These different path can have a different number of levels. if you are talking about unbalanced hierarchies, yes, BOARD support them. The user-defined hierarchies are hierarchies of related entities in the database that are used in BOARD to organize members of an entity in hierarchical structures and provide navigation paths in a cube. In a balanced hierarchy, all branches of the hierarchy descend to the same level, and each member's logical parent is the level immediately above the member. In an unbalanced hierarchy, branches of the hierarchy descend to different levels. Parent-child hierarchies are unbalanced hierarchies. Now Board will be able to display an unbalanced hierarchy, starting from a standard structure. All the intermediate members with only one parent will not be shown but will be shown directly leaf levels. In order to display an unbalanced hierarchy you need to create a standard bottom-up hierarchy, defining: entities and relations. Define as many entities as there are levels in the ragged hierarchy. Load data as a flatten hierarchy. 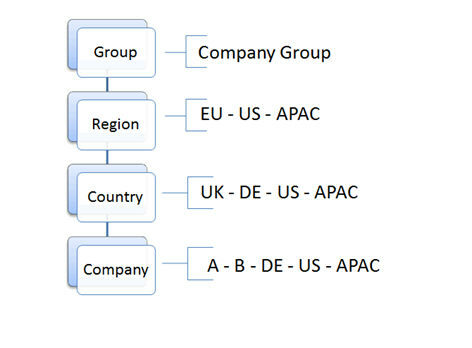 In this sample I want to realize a hierarchy about an organization company. We have 4 levels: Group, Region, Country, and Company. 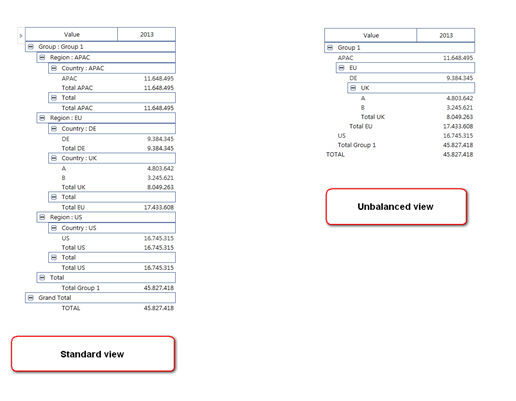 In order to display an unbalanced hierarchy in a dataview, select dataview properties in ribbon bar, under Graphic Options menu, set up “unbalanced Hierarchy” property. 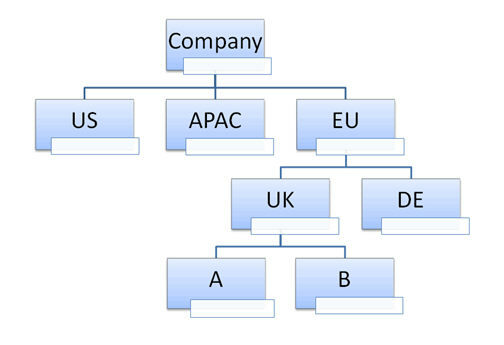 Below a sample of a representation of the organization company hierarchy, in a standard dataview and in a dataview with unbalanced view. For any parent-child relationship that includes one to one item only the grouping visualization is ignored reporting one row only. this is what exactly i was searching for. Hi Andrea, I have an issue with ragged hierarchies, that hasn't been able to fixed. I explained the issue in the last interaction of this topic. It is important to highlight that I am using the unbalanced hierarchie feature in Board, and yet not getting the disposition I want. If you could give me an advice about this, I'll appreciate it. As you can see, I stablished a Code column and a description column. Your source file seems correct to me. My question is: do you use the option Unbalanced Hierarchy into your dataview? I think that activating this option will allow you to have the data view as you edited yourself. If you use the Unbalanced Hierarchy the 1.1 member will be breakdown by row as you want. Is there any command I could use in the query that allow me to copy the aggregate Code and description for a null value?, that also verify the other hierarchy levels looking for null values? Do you have any comments on how to solve this clustering issue? It seems to me it's working correctly, hence i think i do not understand exactly what you want to do. It will be matter to open a ticket and see if the support can guide you to the solution you are expecting.